River Downs Club open the public. Doors open 45 minutes before Race 1 post time (TBD). $5 standing room only (no seat/program included). High top tables in front section of RDC for standing room only. PLEASE SEE THE RIVER DOWNS CLUB HOST OR CALL 513-354-8418 TO RESERVE YOUR SEATS! ALL RESERVED SEATS MUST BE PAID FOR IN ADVANCE AT THE RDC HOST. 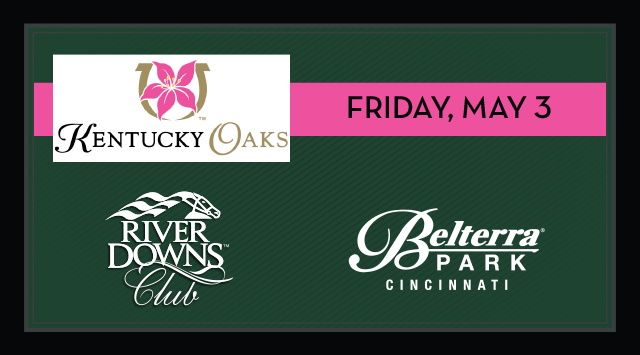 ALL GUESTS WITH SEATS IN THE RIVER DOWNS CLUB WILL RECIEVE A FREE LIVE BELTERRA PARK PROGRAM. Kentucky Oaks® and Churchill Downs® are registered trademarks of Churchill Downs Incorporated. All rights reserved.